An electric mixer has become an indispensable tool in home kitchens. Before their arrival on the culinary scene, home cooks had to stir cookie dough by hand, whisk egg whites or cream until their arms ached, and master the technique of kneading bread to ensure lofty loaves. But now, an electric mixer can do all of those tasks for you, and it'll probably do a better job. Here's what you need to know before buying an electric stand mixer or hand mixer. A stand mixer has a powerful motorized base with a head that holds the beater attachments and a bowl that locks into place beneath the beaters. A hand mixer, meanwhile, has its motor in a lightweight housing on which removable beaters are mounted. The mixer is held over a bowl and can be moved around to ensure its contents are evenly mixed. Between the two, a stand mixer is usually pricier because it's a bigger and typically more powerful piece of equipment. There are advantages and disadvantages to each type of appliance. A stand mixer has a more powerful motor, so it can tackle stiffer doughs, such as thick cookie dough or bread dough. Some stand mixers also have accessories available for purchase that allow you to use the machine for everything from making ice cream to making sausage. But, a good stand mixer can also be expensive (starting at around $200). Because they are bulky and heavy, they will likely need to take up a permanent spot on your counter or need room to be stored. A hand mixer is fairly compact and can easily be stashed in a cabinet or drawer. You can buy a decent model for under $100. Since it is handheld, you are able to control the path of the beaters, moving them around the bowl to ensure that no ingredients are missed. You can also use it with just about any bowl, large or small. The drawback is that the motor isn't as powerful, so hand mixers are really only good for thinner, softer doughs and batters, as well as whipping cream or beating egg whites. If they can afford it and have the storage space, many baking enthusiasts opt for both, since the hand mixer is relatively inexpensive and can be used for smaller baking projects. Another option is Cuisinart's Power Advantage Hand/Stand Mixer, a hand mixer that converts into a stand mixer by mounting onto a base. KitchenAid is arguably the best-known brand in the mixer category, especially when it comes to stand mixers. The company created the category when it debuted the first stand mixer for the home in 1919. But KitchenAid's popularity doesn't mean that it's the only option on the market, or even that it's necessarily the best. KitchenAid's mixers start with the Classic Series and go up to the Professional and Commercial collections. At the entry-level end of the market are stand mixer options from Sunbeam and Hamilton Beach, which are less than $50 but are not as sturdily constructed and have smaller work bowls than other models. They're also made of lighter-weight materials, which means they're not as durable and they could "creep" across the counter, particularly if they're beating a particularly stiff dough. At the high end, Breville makes a stand mixer that has a built-in timer and a rugged, die-cast metal construction. Cuisinart's models also have a countdown timer as well as optional attachments that are sold separately. One of the priciest, and best-quality, mixers is from Viking. It has one of the most powerful motors on the market (1000 watts), metal gear transmission, and even wheels to easily move it around the countertop (a nice touch considering it weighs more than 20 pounds). 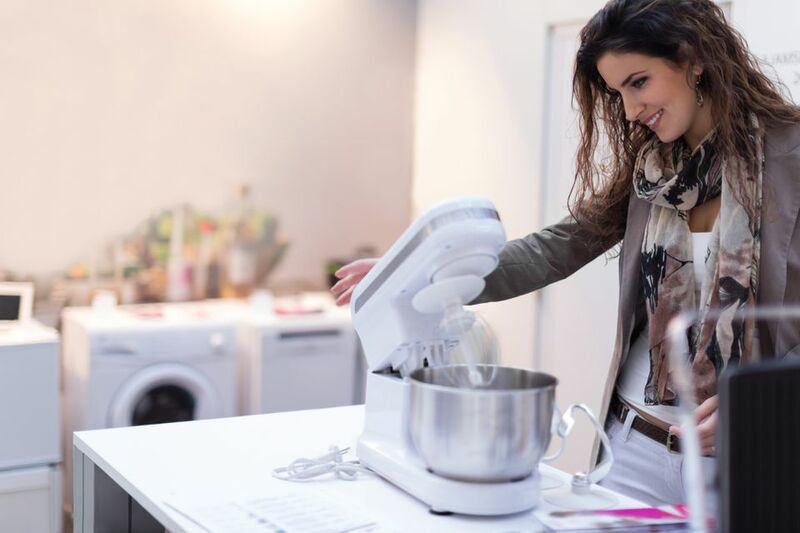 In terms of hand mixers, most small appliance brands make them, and the performance of higher-priced brands is not necessarily markedly better than more affordable brands, although more expensive models might have additional features or a better design. Ultimately, the best advice is to choose the brand that you feel has the best reputation or the best quality product you can afford. Don’t settle for a stand mixer with less than 250 watts of power. Anything less and you won't be able to mix anything thicker than pancake batter. Pricier models have more powerful motors; Breville's model has a 550-watt motor and Cuisinart has an option that has a 1000-watt motor. Countdown timers, such as those in Cuisinart's and Breville's models, are a nice feature. For example, you can set them to knead bread dough for 10 minutes and the machine will turn itself off when it's done. KitchenAid stand mixers are known for the little plug on the head which can be used for accessories; the company sells a wide arrange of attachments, including citrus juicers, ice cream makers, sausage grinders, pasta extruders, and more. The plug is universal, so every KitchenAid model, regardless of how old or new it is, will fit every attachment. Cuisinart also has a similar feature; its stand mixers have three outlets in which to plug attachments, but the company does not have as wide a selection of attachments. Some stand mixers tout "planetary action" mixing; this means that the beaters take an elliptical path around the bowl to ensure uniform mixing. Most, even the cheapest, come with three basic attachments: a paddle for general mixing, a whisk for beating cream or egg whites, and a dough hook for kneading bread dough. Hand mixers are typically 200 to 250 watts of power, and for the thinner mixtures that these are typically used with, a motor that is 200 to 225 watts should work just fine. Features to watch for are the types of beater attachments included, the range of speeds, and whether there is a storage case for the accessories. Don't bother with a hand mixer that has a dough hook. Chances are the motor isn't powerful enough to handle bread dough. It would also be too uncomfortable holding the mixer over a bowl for the amount of time it takes to machine-knead dough. Tilt-Head or Bowl-Lift Stand Mixer? Most stand mixers have a tilt-head design, where the bowl remains stationary, locked into a base, and the head is on a hinge so it can tip up to lift the beaters out of the bowl. KitchenAid, however, makes a number of models that have a bowl-lift design, in which the bowl locks onto a frame, and a lever is turned to lift the bowl up to meet the beaters. The bowl-lift design was originally used mainly in commercial kitchens but is now available in some of KitchenAid's higher-priced and larger-capacity mixers. The advantage with the bowl-lift design is that the mixer can fit underneath a cabinet and does not have to be moved forward in order to use it (with the tilt-head mixers, there wouldn't be room under a cabinet to lift up the head). Some people prefer the bowl-lift mixers because they look more professional and they often have a larger bowl capacity. But others like the tilt-head design because you get more access to the bowl, in order to add ingredients or scrape down the side. Mixers come with a range of bowl sizes; it's important to choose a size that will be most useful to you. The standard size is between 4.5 and 5.5 quarts. This is large enough to bake a batch of cookies or knead a loaf of bread. If you do a lot of large-quantity cookie or bread baking, you might want to opt for a larger mixer; KitchenAid claims its 6-quart mixer has the capacity to make 13 batches of cookies or more than 8 loaves of bread at once.